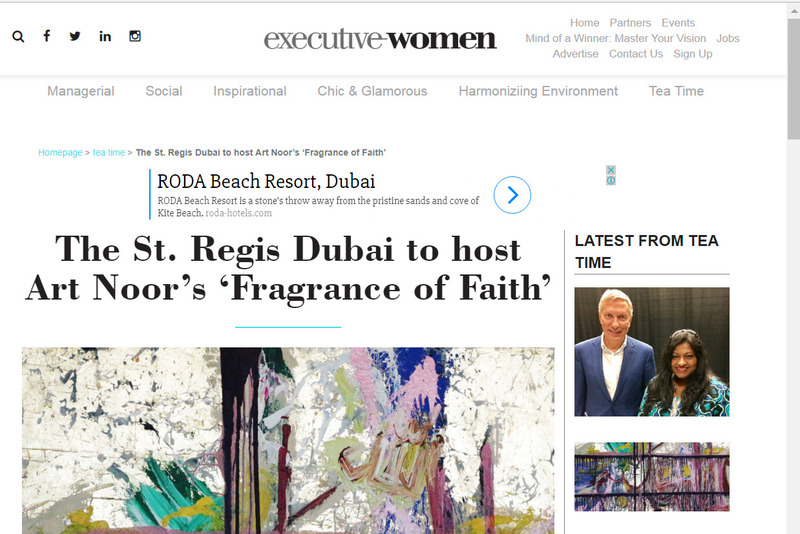 Art Noor’s Exhibition of Paintings of the 99 Beautiful Names of Allah Hosted by St Regis Dubai, to open in Ramadan. 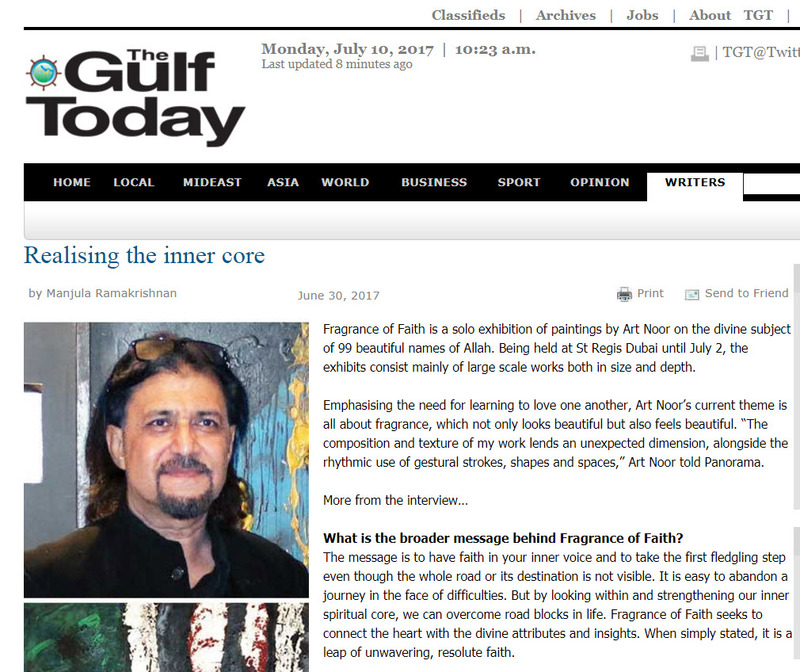 Sharjah based artist Art Noor, known for his paintings of the divine names of Allah, has been on a journey of exploring the spiritual and the artistic frontiers. 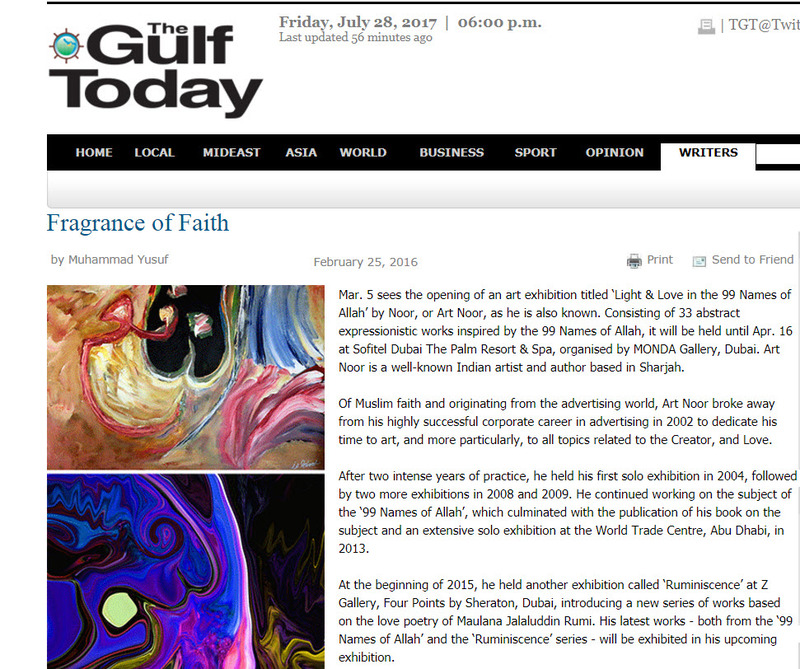 He does that by fusing the meanings of the names of Allah, in his paintings, which have been growing both in scale and creative depth since 2004, when his first solo exhibition was hosted by Sharjah’s directorate of Art. Last year his 8th solo exhibition, Love N Light in the Names of Allah at opened at Sofitel, The palm a few days before Ramadan, with an event featuring an enthralling Tanoura dance performance for the packed roomful of guests from all corners of the globe. It was organized by the MONDA Gallery owner Etienne van den Peereboom, who has been associated with Art Noor, and distributes his signed prints of his artworks, through Kinokunia, located at the Dubai Mall. 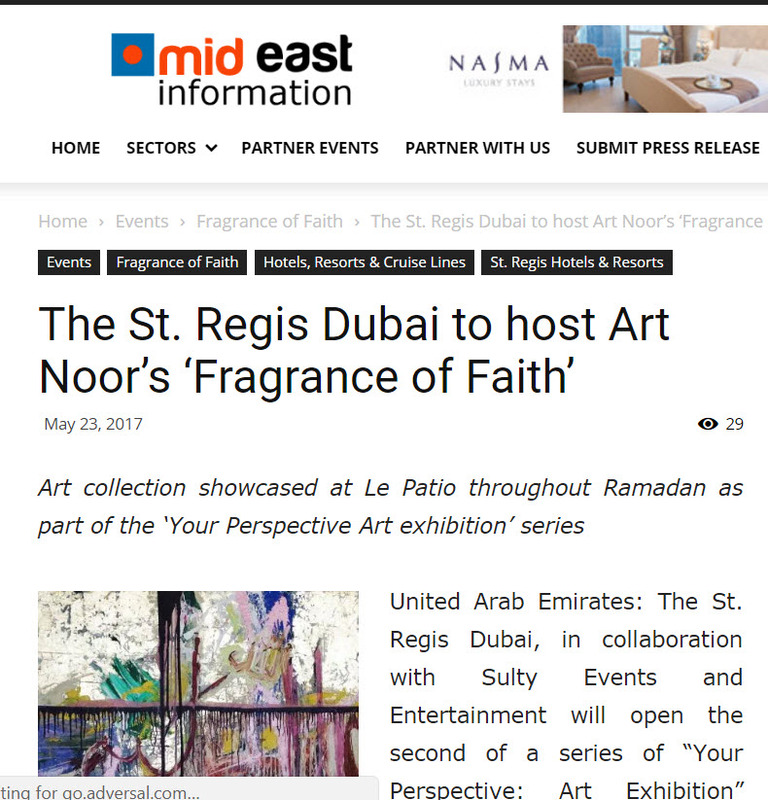 A few days before the start of Ramadan of 2017, Art Noor’s latest exhibition of paintings, titled “Fragrance of Faith” opened at Le Patio, St Regis Dubai, on 24th May with Iftar preview of Le Patio menu, for specially invited gathering of VIPs, media, and prominent art lovers of the region. The exhibition is his 9th solo, and consists of 48 large scale paintings exhibited in the grand corridors surrounding the Le Patio, with an elegantly designed Ramadan tent, which can accommodate up to 300 guests both for Iftar and Suhoor gatherings. The art selected in this initiative are ideal as masterpieces in art galleries and private collectors residences. Diplomats, Art Collectors, regional Business leaders and media will be attending the opening night of the exhibition. The collection is curated by the French curator, Delphine Meaux, who has been involved with Arts in the region for many years, and is in collaboration with the Artist to take the exhibition to international arena during the coming months. The exhibition continues to draw visitors during Iftar and Suhoor time, and will continue till 2nd July 2017. It is open to public, round the clock and is free to visit. The Event is supported by China International Development and Investment Corporation Limited, Coral Coast PR and Art Cocoon. A new paintings exhibition is opening at the beginning of March at Sofitel Dubai the Palm Resort and Spa, celebrating “Light and love in the 99 names of Allah” through a series of abstract expressionistic works by well-known and long standing artist & author Art Noor. 33 paintings will be exhibited and a copy of Art Noor’s book entitled “99 Names of Allah” will be gifted to every visitor of the opening events, while high quality affordable prints of Art Noor’s large body of work will be made available to visitors by MONDA Gallery who is organizing the event. The exhibition, taking place in Sofitel The Palm’s dedicated art space on the ground floor of the resort, will be launched through an opening on Saturday, March 5th. With his roots in the international advertising world, ART NOOR broke away from his highly successful corporate career in adverting in 2002 to dedicate his time to art, and more particularly all topics relatedto God, and Love. After two intense years of practice, he held his first solo exhibition 2004, followed by two more exhibitions in 2008 and 2009. Art Noor continued working on the subject of ‘99 Names of Allah’, culminating in the publication of his book on the subject and an extensive solo exhibition at the World Trade Centre, Abu Dhabi. In the beginning of 2015, Art Noor held another exhibition called ‘Ruminiscence’ introducing a new series of works based on the love poetry by Maulana Jalal Uddin Rumi. His latest works both from the 99 Names of Allah and the Ruminiscence series will be exhibited in his upcoming exhibition. Art Noor will be present at opening on Saturday March 5th, from 11am to 8pm, where he will be handing overand signing his book for the visitors. The exhibition is free to attend and will run until 16 April 2016.